I was lucky enough to attend the meet-and-greet with the Joy Formidable, giving fans an informal half hour with the band before the show. The band impressed me with their sincere interest in what I and the other fans there wanted to hear—they came across as genuinely nice people. The band played “The Last Thing on my Mind” and “Lonely,” a lovely pair of acoustic songs with Rhiannon “Ritzy” Bryan singing and playing guitar; Rhydian Dafydd, the band’s bassist, playing guitar and singing harmony; and Matt Thomas, the drummer, playing a cajon, or drum box. Ritzy brought her dog, a longhaired dachshund named Tony, who, by the end of the meeting, managed to completely disembowel the stuffed toy he was playing with. The main event opened with the Helio Sequence, indie rockers out of Portland, Oregon, who created a full, powerful sound. The pair, consisting of Brandon Summers on guitar and vocals, and Benjamin Weikel on drums and keyboards, were enthusiastic and energetic. The size of the band was belied by their sound, which they augmented with looping to create a big, full wall of music. And though they were but small, they were fierce! A shoutout needs to be given to the roadies and other hardworking people who work behind the scenes, as well as onstage, to make the shows possible. They lug equipment on and off stage; they set up and tune the instruments; and they make sure the musicians have what they need to entertain us. And they make the transitions between sets appear quick and painless. 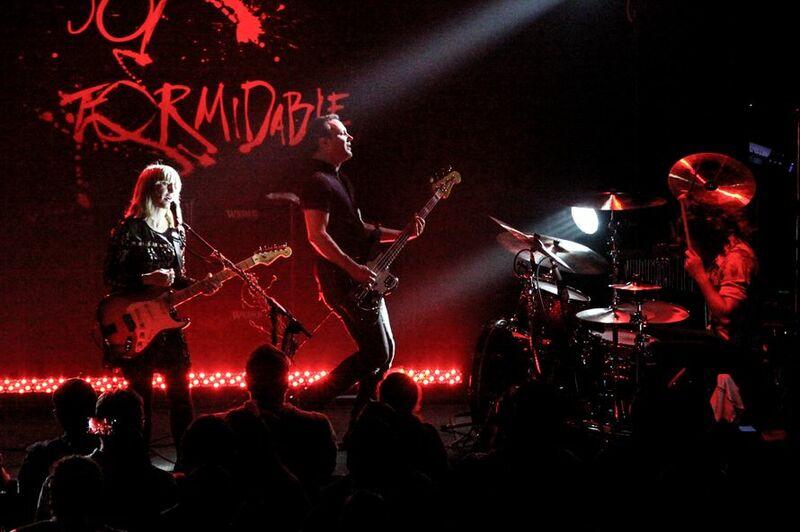 When the Joy Formidable opened for the main set, the sweet acoustic sound of the meet-and-greet was replaced with a long set of hard-driving, alt-rock numbers. The band started with “The Greatest Light Is the Greatest Shade,” and they played a good portion of their CD The Big Roar with “Whirring,” “Ever-Changing Spectrum of a Lie,” and other songs; then they performed several songs from Wolf’s Law and from their new CD, Hitch. Ritzy shredded the guitar and Rhydian blew up on the bass, while Matt's punchy drums drove the sound, which was big and driving and full of energy. The crowd went wild—the excitement was incredibly loud and almost palpable. It was a good night at the Vinyl!